The New York Botanical Garden continues to explore the connections between the plant world and the arts through captivating flower shows and fine art in its upcoming exhibition, Impressionism: American Gardens on Canvas, from May 14 through September 11, 2016. During this Garden-wide exhibition, visitors will experience the horticultural inspiration behind American Impressionism as well as view more than 20 Impressionist artworks. In the Seasonal Exhibition Galleries of the Enid A. Haupt Conservatory, visitors will stroll through an American Impressionist garden inspired by the paintings of iconic artists, including William Merritt Chase, Childe Hassam, and John Singer Sargent. The horticultural exhibition is designed by Francisca Coelho, the Garden’s Vivian and Edward Merrin Vice President for Glasshouses and Exhibitions, who has re-imagined gardens for NYBG exhibitions, including Emily Dickinson’s Victorian garden in Amherst, Massachusetts; Claude Monet’s flower and water gardens in Giverny, France; and Frida Kahlo’s Casa Azul garden in Coyoacán, Mexico. 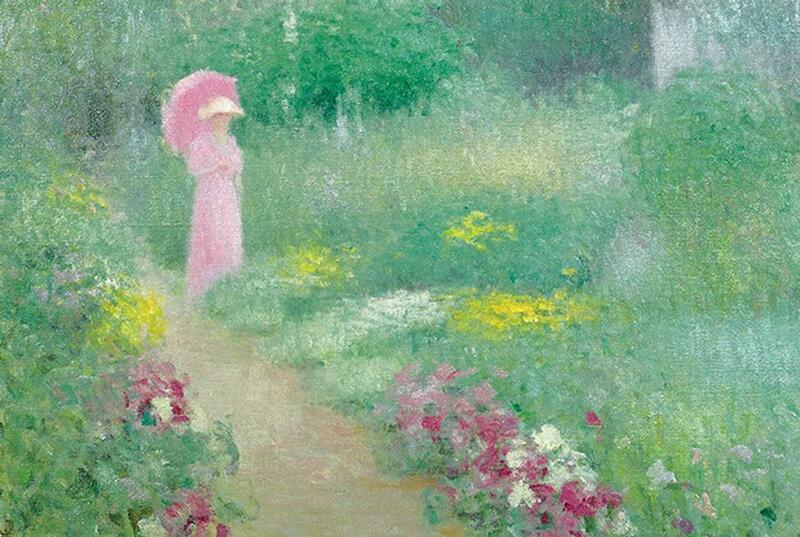 Coelho’s American Impressionist garden will feature an ebullient mix of the old-fashioned flowers depicted in paintings of the gardens of Florence Griswold, Celia Thaxter, John Twachtman, and other celebrated gardeners of the era. Under Coelho’s direction, NYBG horticulturists will plant tens of thousands of cornflowers, larkspur, hollyhocks, peonies, columbines, and hundreds of other cheerful bulbs, annuals, biennials, and perennials in beds and borders lining the walkways. Visitors will stroll beneath trellises adorned with morning glories, through grassy meadows dotted with poppies, and along beds of irises of every color of the rainbow. They will be encouraged to sit on chairs on the porch of a charming New England cottage with views of the whole colorful ensemble. The LuEsther T. Mertz Library’s Art Gallery at NYBG will exhibit a complementary display of more than 20 paintings and sculptures by Chase, Hassam, Sargent, and their contemporaries that captures the colors, shadows, and ephemeral quality of light the artists observed in the natural world and infused in their distinctive imagery. Edmund William Greacen’s In Miss Florence’s Garden (1913). 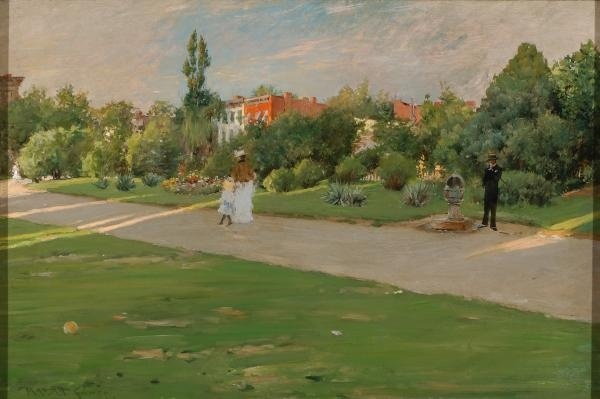 and Park in Brooklyn (1887) portray luscious landscapes of familiar East Coast sites. Sargent’s The Fountain of Oceanus (1917) features a sculpture at Kykuit, the John D. Rockefeller Estate in Pocantico Hills, New York. Childe Hassam’s Horticulture Building, World’s Columbian Exposition, Chicago (1893) depicts a social scene in front of a Victorian glasshouse similar to NYBG’s Haupt Conservatory. Three bronze sculptures are also included in the exhibition, most notably Anna Vaughn Hyatt Huntington’s grand Diana of the Chase (ca. 1922), which at 99 inches tall will be on display in the Library Gallery Rotunda. Impressionism: American Gardens on Canvas is guest curated by Linda S. Ferber, Ph.D., Senior Art Historian and Museum Director Emerita of The New-York Historical Society. American Impressionists in the U.S. created an identity unique from their French peers by painting self-consciously American subjects: notably, the American garden. Many American Impressionists and their spouses were avid gardeners, and parallels were often made between gardening and Impressionism. In a departure from other exhibitions on this artistic period, Impressionism: American Gardens on Canvas will examine exclusively American gardens as a compelling subject for American Impressionists during an era of vibrant gardening culture, evoking this period through a garden designed and created in the Haupt Conservatory for visitors to experience.